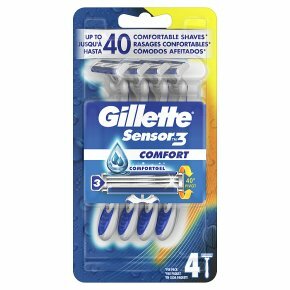 Gillette Sensor3 disposable razors have 3 spring mounted razor blades on a pivoting head to adjust to every detail of your skin for a close, smooth, comfortable shave. Up to 10 comfortable shaves per razor. Disposable razor with 3 skin sensing blades for a comfortable shave. Enhanced Lubrastrip with water-activated Comfortgel technology for ultimate comfort. 40° pivoting head which adjusts to the contours of the face. Anti-slip rubber handle for control and manoeuverability. Disposable razor that can get you up to 10 comfortable shaves? Gillette?s Sensor3 Comfort does that thanks to 3 chromium-coated, skin sensing blades and a pivot head that adjusts to the contours of your face. Its enhanced Lubrastrip with water-activated Comfortgel technology provides you with the ultimate comfort. The razor features an anti-slip rubber handle for control and manoeuverability and easy rinse blades for 2x better rinsing (vs. BlueII Plus). Do not wipe off the blade. Keep away from children. Shelf life is unlimited. Production date marked on the package.